Quite the opposite from last week, at least from my very limited experience, guys are simple. Nothing fancy, not necessary to be accompanied by a "meaning", just something nice and practical. However, even though they are simple in some sense, avoid getting something too technical that you aren't sure if he is going to like it. I am not saying I'm an expert of boys, but the following is a list of agreed opinions from my guy friends. 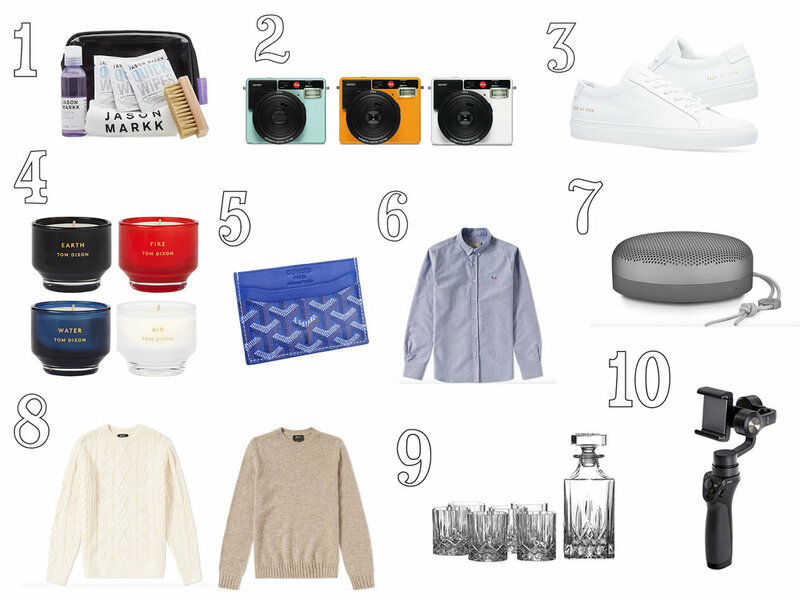 Here you go the 2017 Luxury Christmas Gift Guide for HIM which includes fashion, tech, and lifestyle items – I hope at least one of them rings your bell! The shoe lover's best friend, especially if he has a whole collection of white shoes. You shouldn't be surprised when guys can love their sneakers as much as girls love their bags. The photographer boyfriend? Then that's a good choice for him to take photos of you two together. As I mentioned earlier, guys collect shoes too. So another pair of special, uncommon white sneakers can for sure surprise him. Sorry for not being humble, because I do find good white sneakers. Candles might not be the number one gift for all boys, not until they have tried one. Not all candles have to be sweet and romantic, it can be unisex too. Try it to find out. Since Goyard's inception some 164 years ago, the trunk and bag-maker has maintained a mysterious and impressive reputation based on quality and prestige. With zero advertising, no e-commerce, and very few stockists, I am sure any boy with a taste will understand. A shirt with a fox, the boys know their shirts. Spoil your boy with a nice speaker during parties, date nights or anytime at home. What about something warm for the winter so that he can give you the warmest hug ever? If you do not know how to pick his Whiskey/Scotch, at least you know where to find the best wineware to hold his wine. Boys will always be boys when it comes to tech things no matter how old he is. Dji for big boys while toy'r'us for the small boys, same level of excitement.